If you are a fashionista, that is well aware the current trends you know that this jacket embodies many of them. 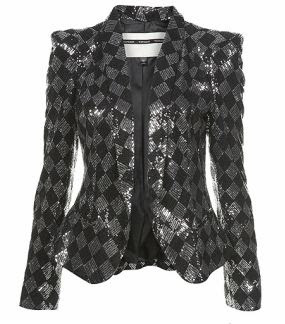 Small, structured shoulders, glamorous sequins and the classic sophistication of a tailored blazer. This jacket is the BOMB! (So 90's, I know) Topshop approved, with a price of $170. Link here for more on the product. **Remember** If you are going for flash up top, then your bottoms, shoes and accessories need to compliment the one piece, not fight with it. That is what separates the young stylistas from the more mature stylistas, proper balance.